Initially written on November 21, 2007. Latest revision on November 26, 2007. Visitors can click on most of the photos below to see larger images and can click here to view a nine-minute video that Helen produced. 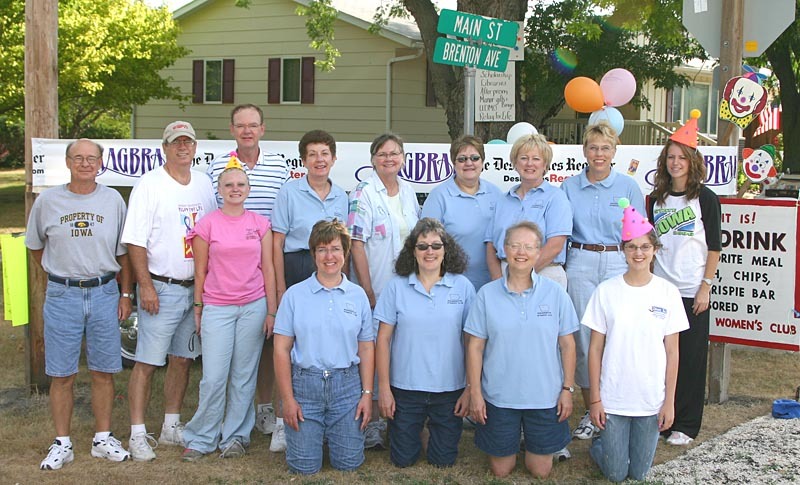 The Des Moines Register's Annual Great Bicycle Ride across Iowa (RAGBRAI) went through Rolfe on July 23, 2007. I was there with camera, starting on a county road northwest of Rolfe and ending in town. However, I regret not capturing more variety or heading east where a farm couple, Mike and Joni Behrendsen (RHS 1961 and circa 1969), served root beer floats. It also would have been great to photograph riders on the picturesque hills east of town and crossing the Des Moines River. I was not able edit the footage until this week, because for most of the summer, I was fully engaged in gardening at the home with large lot in Ames that I acquired in 2006 . You can click here to access the nine-minute video. It is simple and in Windows Media format. The visual quality is much inferior to that of seeing the program on a DVD. Soon there will be DVD copies available to those who want them. Cost has yet to be determined. Drop me a note if you are interested in getting one. There is a section of the video that features my father, Deane Gunderson (RHS 1935), with some of his family, friends, visitors, and an 11-foot-tall statue of a red bird. The bird is a replica of Cy (the traditional mascot for Iowa State University). Deane, who is a retired Rolfe area farmer, has degrees in agricultural and mechanical engineering from Iowa State and made the steel statue in about 1975. From the late 1970s through the early 1990s, the statue stood at the north end of the Iowa State football stadium. Later it came to rest for several years, rusted with nary a hint of paint and scruffy, in Deane's machine shed. However, with the help of his farm tenants, Dan and Roger Allen (RHS circa 1967 and 1969) as well as Rod Bunda of the Collision Center in Pocahontas, the statue was repaired and painted. Then it was perched on Main Street in time for the RAGBRAI festivities near the law office of Deane's son, Charles Gunderson (RHS 1962 , ISU, and the University of Iowa). The statue is still perched on Main Street. Deane had a full day on the 23rd, greeting RAGBRAI visitors, visiting with them about the statue, and having his picture taken with them. I would have been remiss if I did not focus a little attention on his 15 minutes of fame, but there was much more involved in the Rolfe community hosting RAGBRAI that I did not catch on camera. A host of unsung heroes made the day such a successful one. Someone should write about the challenges, risks, and joys that are involved when a small town such as Rolfe hosts RAGBRAI. Just how many bottles of water did Mary Allen (left) end up with on her shelves? RAGBRAI was a good lesson in how "location is everything" in marketing. Mary was stationed on the main highway in front of her home, Bud Barn, and the world's largest Clydesdale rocking horse, but a few blocks ahead of the main intersection. When riders approached a town, it appeared that many were focused on getting to the heart of the berg, taking a quick scan of what was available before stopping for food, water, and other amenities, then settling in for a sense of community. Apparently Tom Hamm of Rolfe thawed out hundreds of steaks for the day, planning to cook and sell them to riders for an early dinner in Bradgate (the next town east of Rolfe). But he ended up having to either give or throw away many leftover steaks because riders were eager to get to Humboldt, about another 15 miles down the road, for their supper, entertainment, and night's rest. In 1974, the second year of the event, I rode on RAGBRAI from Council Bluffs to Dubuque. An estimated 1,700 riders completed the trip compared to the 15,000 or so riders this year. Of course a lot has changed. In 1974, there was no Internet with sophisticated weather forecasting to prepare for a day's ride, nor email at local libraries to keep in touch with folks back home, nor cell phones to connect with other riders or call for emergency help. And the bicycles were not as light then or otherwise as technically advanced as they are now. This year, several bicyclists had small carts or other devices to carry boom boxes that blared music into the country air. For the most part, the music was an intrusion into the pastoral nature of the ride, and I was particularly miffed when a few riders ambled obliviously along with their bikes in the crowd in town with their music still blaring even though there was a nearby area where local musicians were performing. I wanted to holler, "Hey, you're rude." RAGBRAI in the early 70s seemed designed for participation by the average rider. If there were people of celebrity status in those early years, they were people such as Donald Kaul and John Karras of the Register, who started event. There was also a celebrated octogenarian rider by the name of Clarence Pickard. I once took a photo of Clarence and his pith helmet. However, those people had a low-key presence and were part of the fabric of the event. None of them was given star status like Lance Armstrong who has ridden RAGBRAI in the last two years. No one I talked to that day had seen Lance. There was rumor that he had gone ahead, quietly in the early morning. I recall a little about the politics of the summer of 1974. In one small town, the number of public toilets was extremely limited, and I stood in a long line leading to the small rest room of the only gas station in that town. The site of the bathroom was not pleasant, and I was turned off by the instructions passed through the line that only every fifth person should flush. I was getting desperate with the call of nature and heard that a beauty shop in a nearby house had a restroom she might be able to use. Sure enough, when I went and asked about their facilities, the stylists were friendly and welcomed me to use the bathroom at the back of the parlor. I had to meander through the room where women were sitting in styling chairs in front of the mirrors and under hairdryers. When I walked back through the room, there was a 13-inch television set. I was surprised to see that Gerald Ford was being sworn in as President to fill the vacancy created when Richard Nixon left office. I sat down to watch and appreciated an excuse to linger and rest from the days ride. It is probably best not to comment on the ethics of the current president. But it was eerie, earlier this year, to see the movie Sicko by Michael Moore about the nation's health care system its archival footage from the Nixon administration. Oh, those jowls, shifty eyes, and huge eye brows of Richard Millhouse Nixon. It is hard to forget his saying, "I am not a crook." I am not a fan of rowdy, tailgating-type atmospheres nor large crowds nor camping with thousands of other people nor eating fast food for many meals in a row. Also, I do not enjoy being on a bicycle for long hours for several days in a row. I need more variety in my week, which means I have not been on RAGBRAI since 1974. Yes, I have owned a couple of new bicycles during the past three decades but had gotten away from serious biking. A few years ago, I gave my perfectly good purple Bianca, ten-speed bicycle to the Friends of Central Iowa Bicycling for their spring fundraiser so that it would not sit around unused and continue to rust on my apartment deck. Then in 2006, I purchased my home in Ames and bought a 1974 Raleigh, three-speed bicycle via the Ames Tribune classified ads for $50. I had no idea at the time how many people would covet the classic bike. However, when I began looking for a used bicycle, I had talked to Ron at Skunk River Cycles who recommended a three or five-speed Raleigh for getting around Ames. Apparently, he has at least one classic Raleigh himself. I rode my Raleigh some last fall and winter, then since April of 2007 have used it for 95 percent of my in-town transportation. With snow and temperatures dropping into the mid and low-20s today, it remains to be seen how much longer I can extend my bike-riding this winter. But on Thanksgiving Day, I did ride across town to the Unitarian-Universalist Fellowship where I had organized a potluck dinner. Last January was mild, and it was possible to ride a lot then. So maybe something akin to that will happen again this year. I have also cut back out-of-town travel and been able to reduce car mileage by about 700 miles per month. I love the tactile and social experience of riding, the benefits to my physical and mental health, a sense of being frugal in at least one dimension of life, the idea of reducing carbon emissions, seeing Ames from new perspectives, and being one of the alternative transportation fringe people in Ames. Hopefully, more people will turn to bicycles for everyday transportation. The last time I had been near RAGBRAI activities was in 1996, when I drove Dad to Sibley so he could participate in the day of RAGBRAI that ended in Estherville. Louie Hammer (left), an octogenarian farmer and actor from Pocahontas riding in a chambray shirt, blue cotton scarf, rolled up bib overalls, and leather boots. Deb Penney (second from left), my dental hygienist in Ames. Warren Scholten (left), a retired special education teacher from Eagle Grove, where I taught in 1974 and 1975. Jon Popp, mayor-elect of Gilbert, where I lived for 13 years before moving to Ames. Jon was appointed to fill the council vacancy created when I resigned in 2002, and I have often criticized Jon and his cronies in the Gilbert Gazette. But RAGBRAI is a time of goodwill, and I had not seen Jon in a long time. That was both because my new focus was on life in Ames and because I was trying to wean myself from several years in which Gilbert government and the ways it skirted Iowa's open meeting and records laws had been too much on my brain. As I stood in the middle of the only stoplight intersection in Rolfe, a voice called my name. I turned, looked, and asked the man if I knew him. He said he was Jon Popp. It is interesting how different a person looks when dressed in bicycle gear and out of ordinary context. We had a pleasant talk, and I felt a sense of healing of the tensions that had existed between myself and the Gilbert council. I also saw Joyce and Julie Brinkman, RHS athletes from the late 1960s and early 1970s. Of course, there were plenty of other Rolfe ex-patriots who rode on RAGBRAI and Rolfe people who worked the event. But I am a late riser, and by starting my coverage northwest of Rolfe and not arriving in town until early afternoon, I missed a lot of folk and activities. 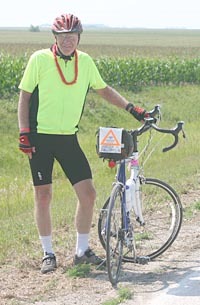 There were also riders from far beyond the borders of Iowa. In fact, it was a revelation, when I was at Skunk River Cycles in Ames the week ahead of RAGBRAI to get a cotter pin replaced, that people from places such as California would ship their bicycles to Iowa where a shop would assemble the bikes for the riders to pick up when they flew into the state. There was an orange-clad clan from California that assembled to let me photograph them near the Pronto Station. Their shirts said "Dog Chow" and "20 years of the 06 Red Dog." 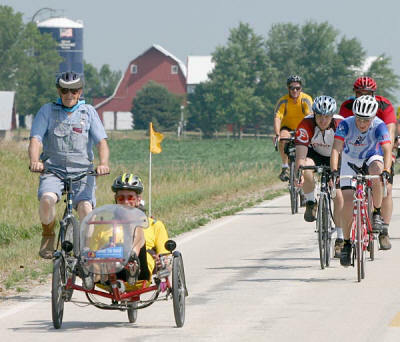 It would be interesting the count the number of towns along an entire RAGBRAI route and know the reactions of their leaders and citizens to the ride coming through their space. How many of them anticipated that RAGBRAI would put their communities on the map and generate lots of income? How many were reluctant to host RAGBRAI? I heard many riders say things such as, "These Iowa small towns are great places." 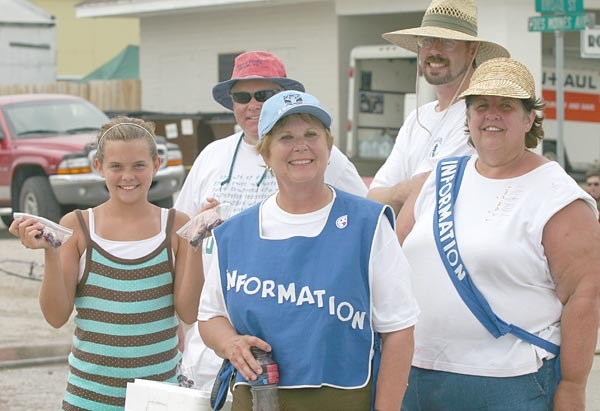 RAGBRAI does bring out the best in Iowa small town culture as evidenced by the civic groups in Havelock and Rolfe that provided thousands of riders with great hospitality. But out-of-state riders cannot truly fathom what a small town is like based simply on a RAGBRAI visit. There are economic and cultural issues in towns such as Havelock and Rolfe. The two bergs are declining in population and financial health and have lost their schools, sending their students to Pocahontas. There are also environmental issues with Iowa having some of the worst polluted rivers in the nation, in large part due to modern agriculture. Farmers are facing dramatically increased costs of production inputs (seed, herbicides, fertilizer, machinery, repair bills, diesel fuel for row crop farmers), and the industrialization of agriculture continues to put a disproportionate share of revenue into corporate coffers. Admittedly, corn and bean prices are at their highest in decades, but it remains to be seen how much the increase in those grain prices will keep ahead of the increased costs of inputs. In other words, will there actually be an increase in the profit margins for farmers—and will it be lasting or a passing bubble? Even with Iowa's panacea of producing Ethanol, an alternative fuel whose revenue that some people think will enrich local communities, the power of the Ethanol industry—for the most part—does not lie in the hands of the locals. Instead, there is the risk as decades go by that the small towns will become more like Third World countries. When cyclists ride by those beautiful fields of corn and beans, they might have nostalgia for what they think the rural scenery represents. But it would be quite revealing for the cyclists to take time to study spreadsheets—either of an individual farmer or those published by Iowa State University Extension. The ISU agricultural economics department has a chart that shows the input costs for each year from 2003 to 2007, and the department's preliminary estimates are that the costs will increase at least another 15 percent for 2008. After the last bicyclists in the multi-hour parade head on to the next town, those issues continue to exist even though there are plenty of leaders and other citizens doing their doggonedness to have viable communities. I wouldn't mind visitors saying that the towns put on great parties. But some visitors seem caught up in a Camelot-type experience during the weeklong ride. They trivialize towns by naively claiming them to be great places on the basis of how they presented themselves for RAGBRAI. Some of the Rolfe welcoming crew. 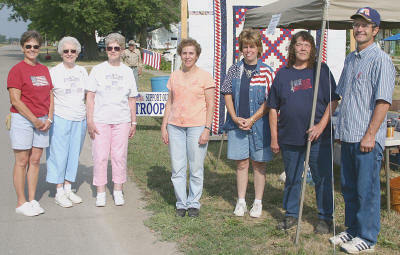 Front row, left to right: Hannah Maley, Beth Pearson, Gloria Gunderson. Back row: Richard Taylor and Mike Majorowicz (RHS 1983). 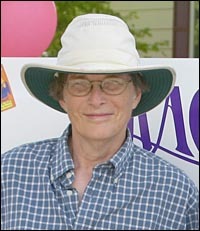 Rolfe did put on a great party, and the Register and riders should thank their lucky stars that towns such as Rolfe are willing to do go to such great effort with so much risk to make RAGBRAI as popular as it is. Visitors can click on most of the photos above to see larger images.